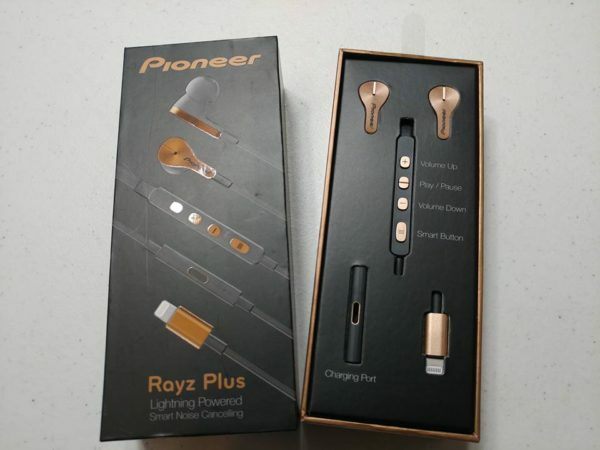 Pioneer® Home Entertainment U.S.A today introduced Rayz TM and Rayz Plus earphones, a new line of truly innovative appcessories for iPhone, iPad and iPod touch. Rayz and Rayz Plus blend the intelligence of an iOS app with innovative Lightning accessories to deliver completely new experiences not possible through the 3.5mm headphone jack. Rayz and Rayz Plus use Apple’s Lightning audio technology and aim to simply and smartly solve the top challenges that today’s mobile consumers experience on a daily basis. Rayz earphones maximize all of the benefits offered by the Lightning Connector. They are powered by iPhone, iPad or iPod touch, meaning no additional batteries are required. The Rayz Plus model is also the first and only Lightning headset with a sleek in-line charging node to simultaneously charge iPhone, iPad or iPod touch while the earphones are connected and in use. Rayz and Rayz Plus are based on Avnera’s breakthrough LightX platform that enables the earphones to operate in modes with the lowest power use possible from iPhone, iPad and iPod touch. The LightX platform also plays host to multiple smart features making the Rayz earphone line the ultimate iPhone companion. Despite its small size, each model contains six microphones which enable several key first-to-market features. To start, Smart Noise Cancellation, a standard feature for both models, is a patented technology that scans your ear and optimizes the noise-cancelling performance uniquely to your ear and environment. In addition, while other noise cancelling products focus on noise for frequent flyers, Rayz delivers exceptional noise cancellation across the entire noise spectrum of everyday life – from commuting, to work, or play and school environments. Rayz also has HearThruä mode which lets in just the right amount of outside noise so you can stay in touch with your surroundings without taking your earphones off. Next, Rayz and Rayz Plus use the embedded microphones to implement sensor-less on-ear detection where the earphones know when they are in or out of your ear and automatically pause and restart your content so you don’t miss a moment of music or video. Rayz smartly enters a low power mode and saves you from accidental battery use if you do not put the earphones back on. Using a combination of the 6 microphones and multi-mic voice processing makes phone calls using Rayz just better, and easier with the smart button. Rayz are the only Lightning earphones to support a one-button click to mute the mics during a call. The programmable smart button also allows you simple access to open apps and to control the advanced features of Rayz.